Mojo means magic, and percussionist/music educator Walt Hampton weaves a powerful spell with twelve more original pieces based on or inspired by marimba music of the Shona people of Zimbabwe. 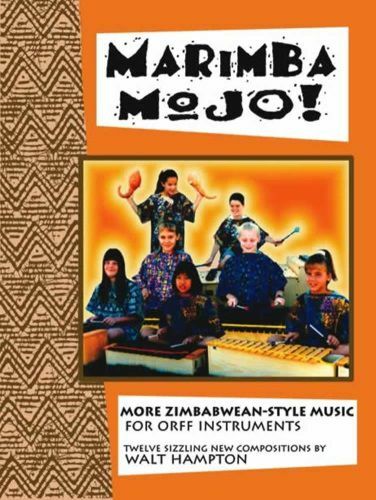 A searing sequel to Hot Marimba!, Marimba Mojo offers a good dose of spice to get your Orff classroom hopping. . . literally! From the first notes of the preliminary exercise pieces to the last beat of the challenging "Musasa," your students will be inspired to chop 'til they drop. They'll fight over who gets to practice during free times in between classes! This collection hits the ground running and never stops to take a breath. Audiences throughout the northwest United States have fallen under the spell of the fabulous performances of Walt's student ensemble Rugare, a group of upper elementary players from Marcus Whitman Elementary School in Richland, Washington. Your groups' audiences will be left wanting more marimba magic - and you'll have "your mojo workin" - guaranteed.